I’m waiting for my flight to Australia after spending the last couple of days in Singapore. First impressions of Singapore are good. I like it. The city is nice and the people are friendly. It rains a lot here. In fact it has rained every day since we arrived. And not the London drizzly kind of rain. It’s more like the biblical forty days and forty nights kind, accompanied by spectacular thunder and lightning. The kind where (even if you have an umbrella) you are soaked within a minute. Awesome. I love thunderstorms. 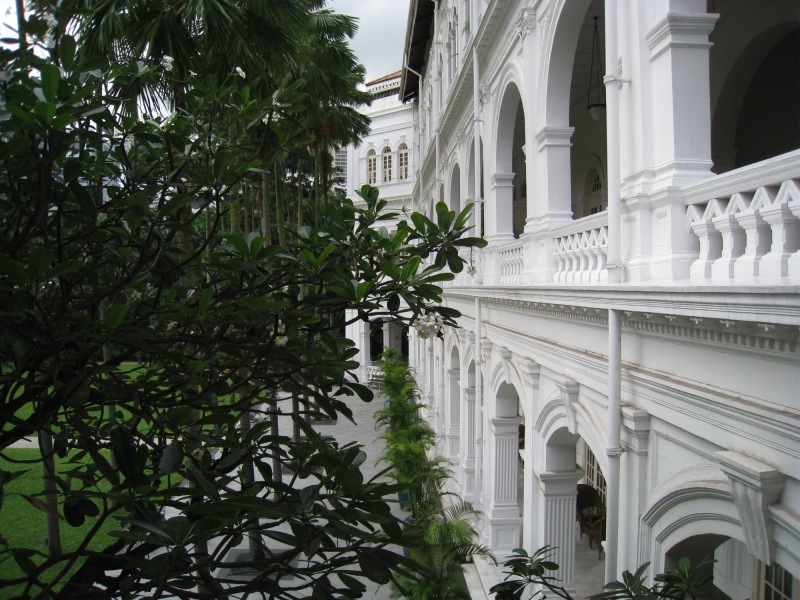 We stayed at Raffles Hotel which was really fantastic. Yes, it was super expensive but it was also super excellent! All the rooms are suites but we were upgraded on check-in to one of the Palm Court Suites and it was amazing. Very big, very quiet. The suites are built around a lawn covered courtyard and each one has a little table out the front where we drank cocktails in the warm evening and ate breakfast in the morning. We had Singapore Slings in the Long Bar, where supposedly the last tiger in Singapore was shot and we had the curry buffet in the Tiffin Room although didn’t really do it justice. I would love to have gone back for more but reached my curry intake limit disappointingly quickly. Today we ended our stay with high tea in the Tiffin Room again. It was nice but pretty touristy. Not quite the same as the Savoy. We only really had one full day in Singapore and most of that was spent in the shops on Orchard Road (great dumplings at Din Tai Fung in the Paragon shopping centre!) but when you stay in a place like Raffles you don’t want to leave the hotel. I highly recommend at least one night there. From the fabulously moustachioed Sikh doorman to your personal butler, the staff are excellent. And the building itself is beautiful; all dark wood floorboards and whitewashed walls stretching up to high, high ceilings. Unfortunately we won’t be staying there on the way back but luckily they have a shop so we have the souvenirs!